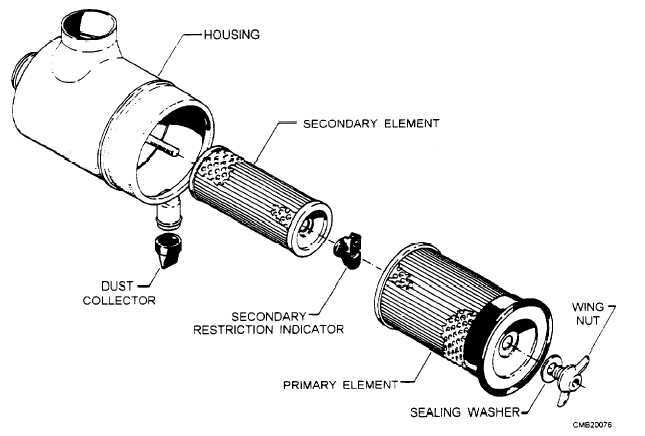 The air cleaner contains a primary and secondary dry filter element (fig. 3-54). An air filter restriction indicator is located at the rear of the air filter housing to alert the operator of the need to service the filters. When a red band appears in the air filter restriction indicator, secure the compressor and service the filters. Place a bright light inside the element to inspect it for damage. Concentrated light will shine through the element and disclose any holes. A damaged element is to be replaced. Inspect all gaskets and gasket contact surfaces of the housing. Should faulty gaskets be evident. replace them immediately. After the element has been installed, inspect and tighten all air inlet connections before resuming operation. Do not strike the element against any hard surface to dislodge dust. This will damage the sealing surfaces and possibly rupture the element. The main oil filter is a replaceable cartridge. The servicing of the filter is required as indicated by the maintenance indicator on the filter or each time the compressor oil is changed. Under normal operating conditions. the oil is changed at approximately 500 operating hours. Under severe conditions. more frequent servicing is required. Figure 3-54. - Air filter.